Browsing articles tagged with " ulnar neuropathy"
Derek is 43 year-old male, who likes to cycle cross country. He has regularly biked 100 miles per week for over 10 years. On weekends he will get up early in the morning and get in a very intensive bike ride. About 2 months ago, he started to feel both hands had weakness and tenderness along with numbness and a tingling sensation bilaterally at the 4th and 5th fingers. He even felt coldness at the 4th and 5th fingers. He sometimes has difficulty typing, and has to shake his hands to rid of numbness after waking up from sleep. He visited his primary care physician, and was given Advil for his pain and told that after a few weeks the pain and numbness might go away. However, he still feels it and is getting worse, therefore, he comes to me for evaluation and treatment. 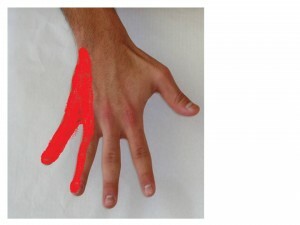 Because the 4th and 5th fingers are supplied with ulnar nerve, therefore, his symptom made me think ulnar nerve entrapment, i.e. Guyon’s canal syndrome. 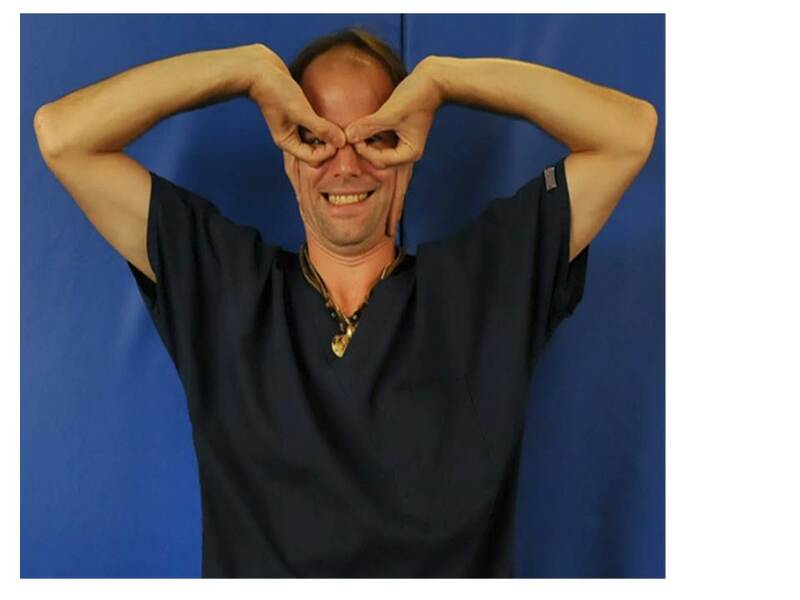 By physical examination, the patient had weakness to make a full fist, and weaker to spread out his 5 fingers. 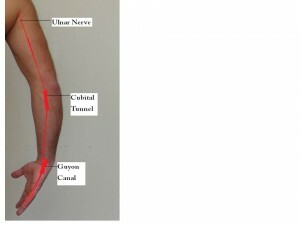 The ulnar nerve is one of the three main nerves in the arm. 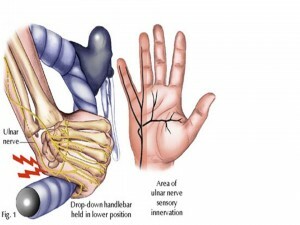 Ulnar nerve is located underneath the shoulder, arm and little and ring fingers. 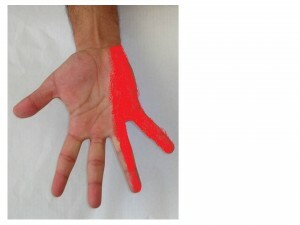 Along its pathway, there are a few locations the ulnar nerve is easily trapped. As indicated at this figure. 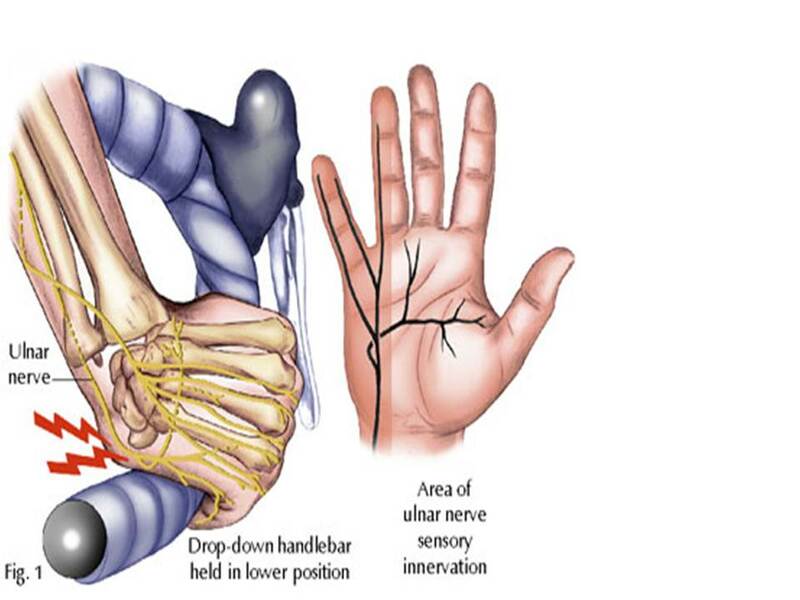 The ulnar nerve functions to give sensation to the little finger and the half of the ring finger that is near the little finger. It also controls most of the little muscles in the hand that help with fine movements, and some of the bigger muscles in the forearm that help to make a strong grip. 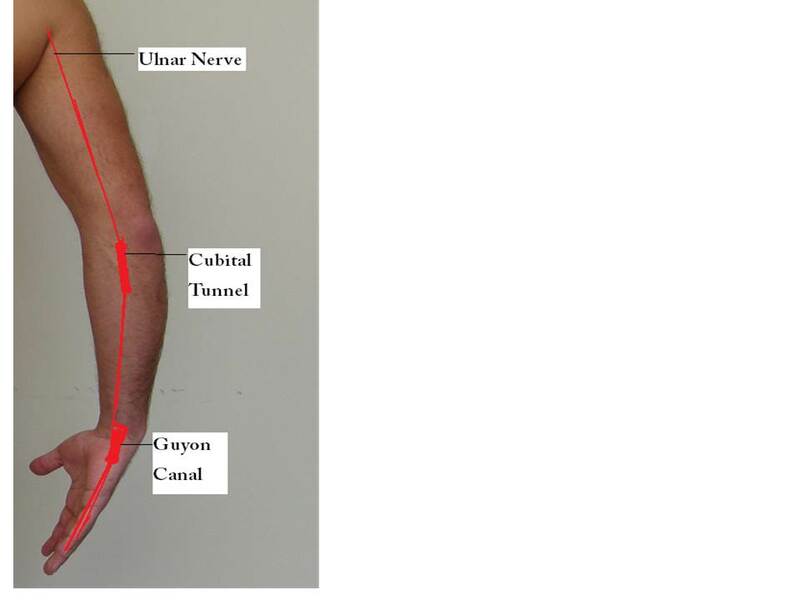 Guyon’s canal : Beyond the elbow, the nerve travels under muscles on the inside of the arm and into the hand on the side of the palm with the little finger. As the nerve enters the hand, it travels through another tunnel (Guyon’s canal). 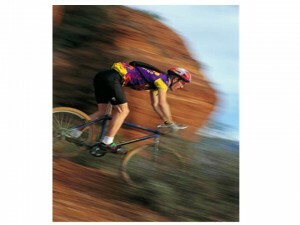 The most common injury is by riding a bicycle for long time, like the above case. Presenting symptoms of ulnar nerve entrapment can vary from mild transient pins and needles sensation, i.e. 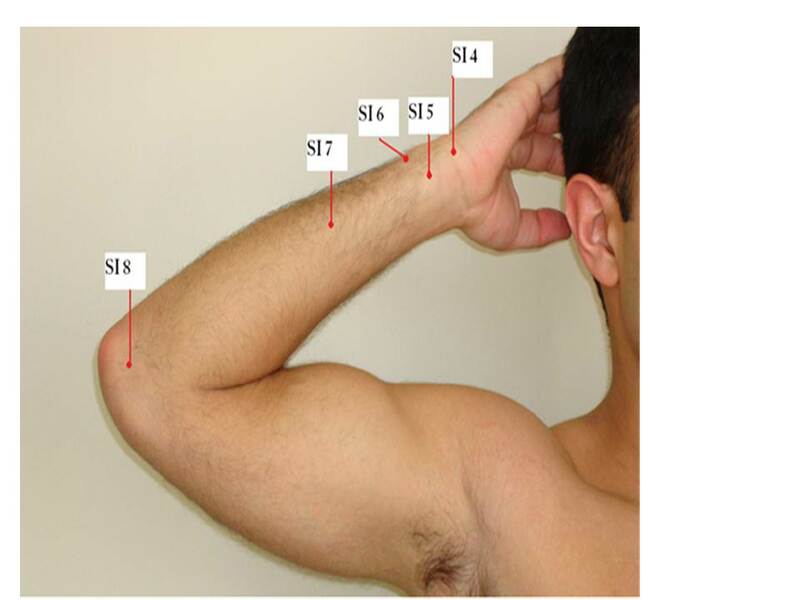 paraesthesias in the ring and small fingers to clawing of these digits and severe intrinsic muscle atrophy.The patient may report severe pain at the elbow or wrist with radiation into the hand or up into the shoulder and neck. Patients may report difficulty opening jars, spreading out hand and fingers or turning door knobs. The patients may feel early fatigue or weakness after repetitive hand motions, such as typing, sorting mails, etc. increasing numbness and paraesthesias may be noticed throughout the day. · Clear medical history taken, your physician should ask you in detail, including when, where, how, the symptom started, etc. · A comprehensive medical examination, including, inspection of any muscle atrophy, palpation of the tender area, range of motion, sensitivity, special muscle strength test, etc. The choice of treatment depends on the severity of your symptom. For mild to moderate ulnar neuropathy, conservative treatment, such as physical/occupational therapy, non-steroidal anti-inflammatory medicine, splints and acupuncture are recommended. 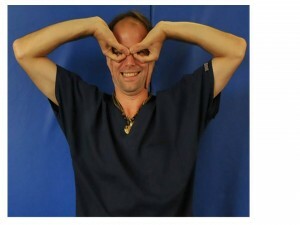 Ulnar Nerve Gliding: perform this maneuver till the hand is upside down with the fingers around the eye as shown below. Hold for 20 seconds x 3 reps.
At the elbow. 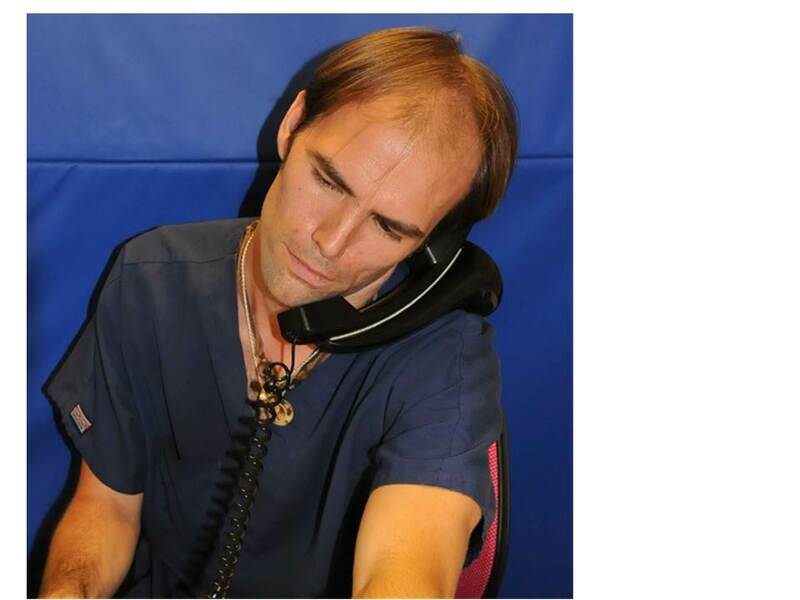 Your surgeon will make an incision at the elbow and perform a nerve decompression. Or your surgeon may choose to move the nerve to the inner part of the arm so that it is in a more direct position. At the wrist. If the compression is at the wrist, the incision is made there and the decompression is performed. 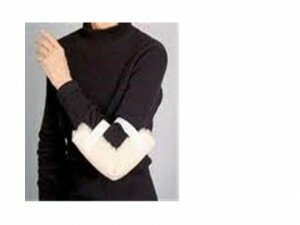 Avoid press your elbow and wrist during sports or work. Temporary numbness and tingling sensation at ring and little fingers usually will disappear without treatment. However, if you constantly press your elbow and wrist, you may have permanent damage.